The ACCRA alongside her berth in North Liverpool docks. At the end of the Second World War, Elder Dempster's mail-boat passenger fleet had been wiped out. Four of the passenger liners were war losses, and on the cessation of hostilities, just the ABA of 1918 remained and was returned to Elder Dempster, but she was not worth reconditioning. 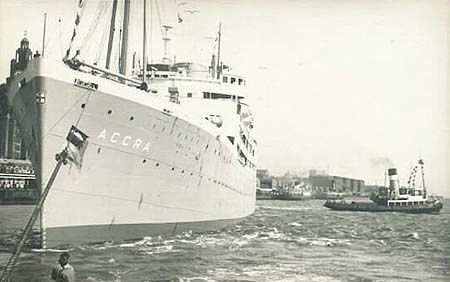 the ACCRA and the APAPA, both launched in 1947. 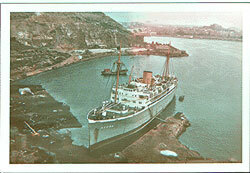 These two ships were larger developments of the pre-war Elder Dempster mail liners of the same names. Four years later the graceful AUREOL entered service, remembered by many on Merseyside as the most beautifully proportioned liner ever to use the port. 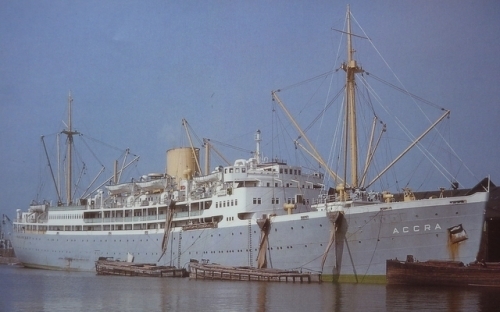 The ACCRA was ordered in February 1945, and was launched at Barrow on 25th February 1947. She left Liverpool on her maiden voyage on 24th September under the command of Captain C.C. Cave. Initially the ship carried a black hull. 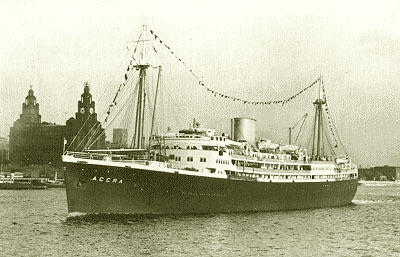 ACCRA built by Vickers-Armstongs Ltd at Barrow-in-Furness in 1947.
air-conditioning was installed in the passenger decks. sail from the Mersey on time, manned by the 101 European members of the crew. The Nigerians were demanding the removal from the ACCRA of the chief steward, second steward and chief storekeeper - all Europeans. They maintained that these three were responsible for discrimination between African and European crewmen over the distribution of food, drink and cigarettes. They claimed that the Europeans got better food; the beer for the African men was diluted, and that they were not allowed to buy certain brands of cigarettes! 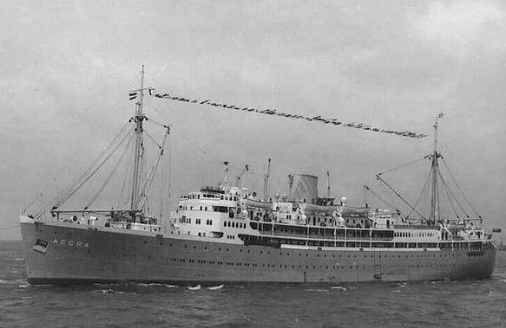 A spokeman for Elder Dempster said that the Europeans on board the ACCRA lived at a rather higher standard than did the African men, but that this would apply in any ship. He commented: "As regards the allegation that the beer is watered down, it's just unthinkable!" 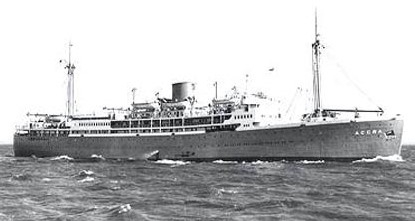 Nigerian seamen were eventually flown back to Lagos in a chartered BOAC stratocruiser, paid for by Elder Dempster. 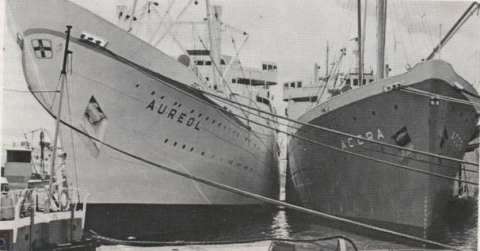 the ACCRA and the AUREOL together at Liverpool. 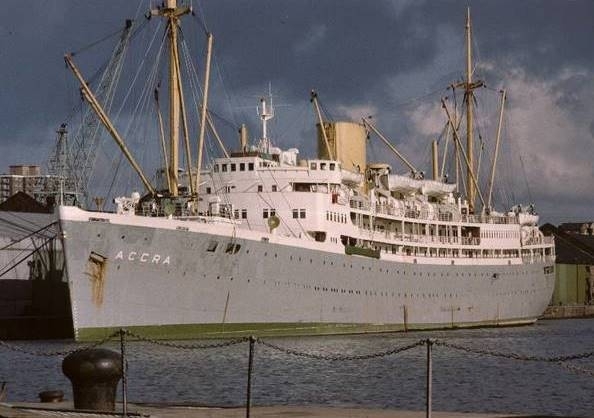 The ACCRA's service in the Elder Dempster fleet was brief and on 8th November 1967, having completed 171 round voyages, she sailed from Liverpool for Cartagena, Spain, where she was demolished by J. Navarro Frances. Disturbed conditions in West Africa, which affected Elder Dempster's traditional trade, played a part in the relatively short career of the ACCRA. The ACCRA being broken up at Cartagena, Spain. on to the ship and I walked along a gangway into the entrance hall on 'B' deck. My previous voyage to sea had been in the cramped quarters of wartime troopers; this was different and it was First Class ! space below two bunks, one of which was underneath a porthole. Bathrooms and toilets were situated nearby. My cabin mate was already installed; like me he was bound for Nigeria on first appointment as an education officer. The ACCRA berthed on the Princes Landing Stage, Liverpool. hairdressing salons for both ladies and gentlemen. be washed down if need be, should spillages occur in rough weather. One end of the saloon was dominated by the captain's table, an elongated oval which seated nine guests. It was flanked by tables for senior officers. Crisp white table linen, sparkling cutlery and glassware shone in the subdued lighting. Tables seated four, six or eight passengers; senior colonial officers and company directors were guests at the captain's table and those of his senior officers. First-tour young men like myself were placed where the purser thought fit, usually close to the doors to and from the galley. Prior to departure all passengers had been asked to provide to Elder Dempster details of rank, title, decorations and branch of service or company. Each of us received a passenger list and it was a formidable document. It included all the hierarchy of the colonial service; company directors of banks or the United Africa Company and bishops of African dioceses. There was a fair number of nursing sisters, women education officers and a handful of unaccompanied wives travelling out to join their husbands. There were very few children on board as it was government policy at that time to discourage parents from taking them to West Africa. Indeed, before the Second World War the reputation of the West Coast had been so bad that wives of colonial officers were allowed to accompany their husbands only with the greatest reluctance and had to pay their own passage. The development of anti-malerial prophylactics and the tremendous contribution made by wives in West Africa to the war effort had done much to relax the attitude of the British Government from the 1950s onwards. The second-class passengers were accommodated aft in four-berth cabins. They had their own lounge and dining saloon, as well as a small area of deck space. The list included missionary families and a few Africans returning home from studies in Britain. to the spartan diets of port-war Britain, the menu was staggering! Soup, hors d'oeuvres, fish, choice of entree, sweets, cheese, biscuits and coffee were served deftly and efficiently by stewards immaculate in bow ties and white jackets. After dinner I wandered up to the boat deck to find a Force 10 gale howling up the Mersey. Departure was postponed for twenty-four hours. 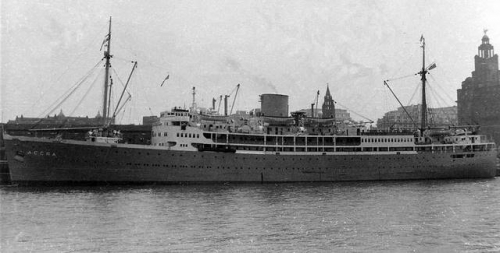 The bars remained closed and the crew was taking unexpected shore leave, but the passengers could not go ashore because of immigration regulations. Worse was the knowledge that Liverpool FC was playing at home, and our cabin steward went ashore to watch them. and eggs or grilled fresh kippers. Fiddles were rigged and the stewards swayed sure-footed with laden trays. was duty-free. Life was good! fruit, Breakfast was available from 08.00 until 09.30. The menu was huge: fruit juices, all cereals known to man, fresh fruit, fish such as grilled sole, bacon, eggs, mushroom and American hash with fried potatoes, bread in variety and Danish pastries. Passengers staggered away to walk the deck, search out library books, plan deck games or just slump into deck chairs in sheltered corners. In the card room the bridge fanatics had established themselves. They played all morning, most afternoons and every evening. The children on board were actively discouraged from entering the room, and only the bar stewards were really welcome to replenish pink gins or brandy gngers at frequent intervals. At around 10.30am hot bouillon was served; this would be replaced by ice cream once the ACCRA was in the tropics. At 11.30am the lounge bar and smoke room bars opened; the beer was popular but seasoned colonial officers preferred a pink gin! Luncheon was served from 12.30.
by stewards or was available on a 'help yourself' basis in the lounge. Dinner was now a formal occasion for all on the captain's table and those of the senior officers. The gentlemen wore stiff shirts, bow ties and mess jackets and the ladies were in long frocks, some with elbow-length gloves. wares on the boat deck. well as dolphins reminded us that we were in tropical waters. 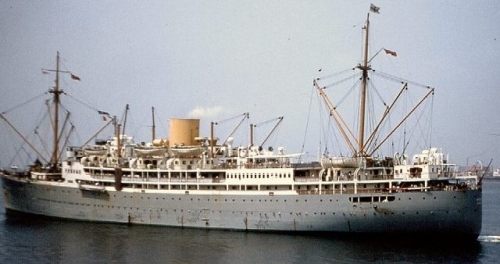 had to wait until the ship had left Freetown to learn of their final desrinations. polo - the Emir is dead keen!" were safely landed without even a splash on their toes! of officers and deckhands working the ship. 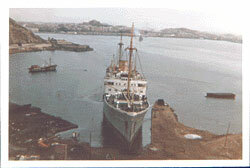 The following day found the ACCRA steaming slowly into the harbour at Lagos. officials claimd to have relatives at K.C. !